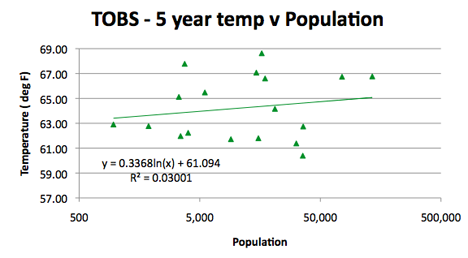 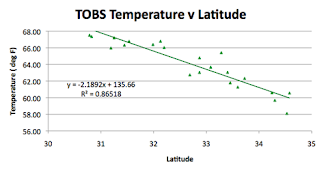 When I first started looking at the temperature data for the individual states around the USA I began each post with a hypothesis, and then looked at the data to see if the hypothesis was validated. 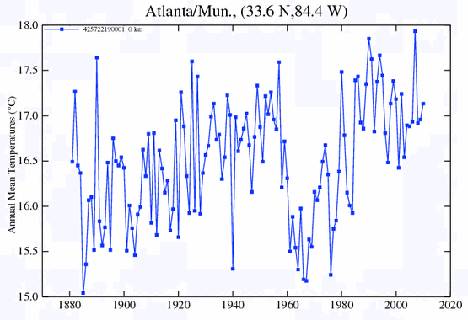 I haven’t done that for a while, but given that the temperatures in Northern Florida have been falling for a while, as have the average temperatures in Alabama, Mississippi, Tennessee, Kentucky, Louisiana, and possibly Arkansas I’m going to rise to the bait and hypothesize that the average temperatures in the state of Georgia have also fallen over the past 115 years. 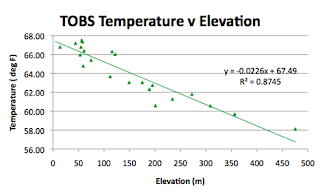 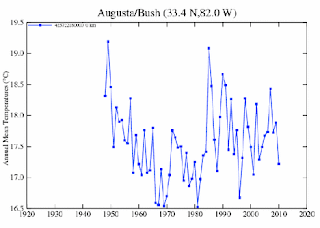 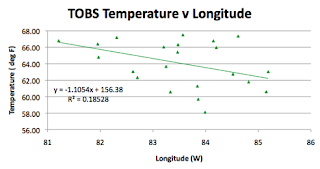 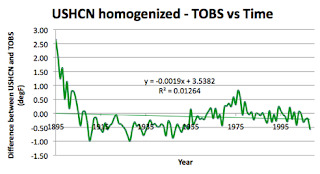 I will take the data from the 23 USHCN stations and, using the TOBS temperatures, see if the hypothesis is correct. 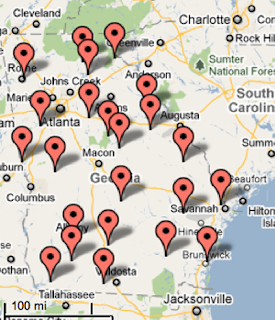 There are three GISS stations on the list, in Atlanta, Augusta and Macon. 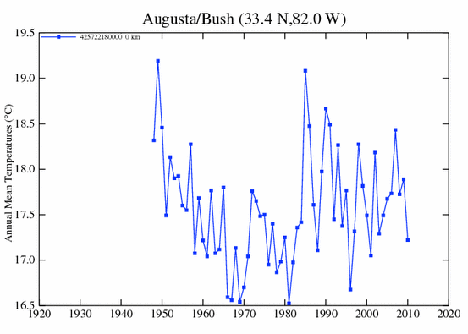 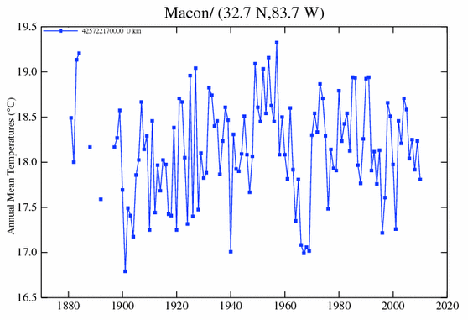 Of these Atlanta and Macon have a sensibly full temperature record from the 1880’s, while Augusta falls into the class of those with data only since 1948. 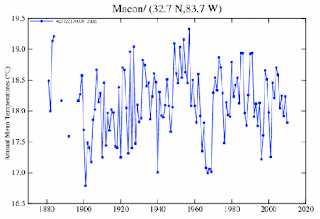 With the exception of the spike in temperatures from 1981 to 1984, the town seems to have been cooling fairly consistently. 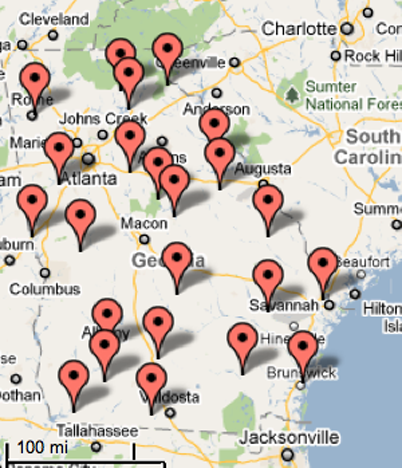 Looking at the other two stations therefore, starting with Atlanta. 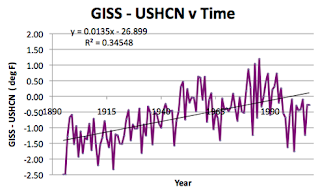 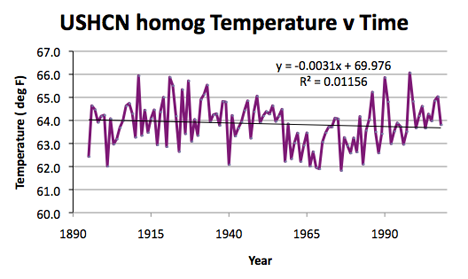 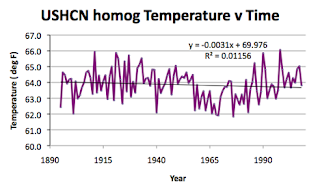 The difference between the two curves can perhaps be seen by the adjustments that GISS has made to the USHCN homogenized data. 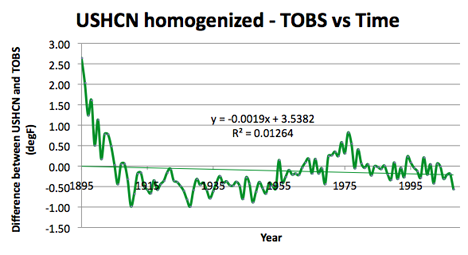 Looking at the raw data, as modified to adjust for time of observation (TOBS) the plot is a little different. 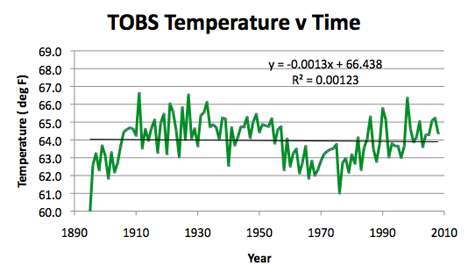 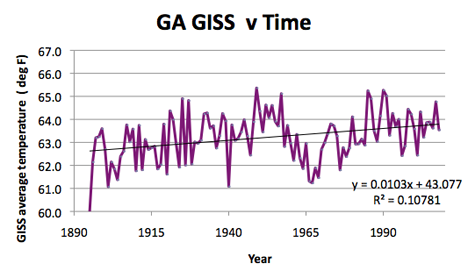 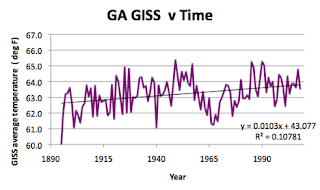 Now while this shows an overall decline in temperature over the century, it also shows a relatively steady increase in temperature since about 1970, so I am not convinced that the hypothesis has, in fact, been validated. Oh, well that’s why they call this research. 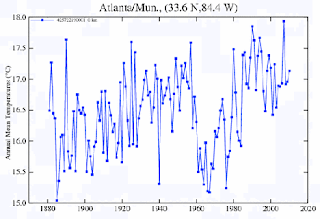 Georgia is 300 miles long and 230 miles wide, running from 81 deg W to 85 deg W, and from 30 deg N to 35 deg N. The average latitude is 32.71 deg N, that of the GISS stations is 33.24 deg N, and for the USHCN stations 32.7 deg N. Georgia rises from sea level to 1,458 m, with the mean elevation being 182.9 m. The average elevation of the GISS stations is 190 m, and for the USHCN stations 152 m.
The population statistics that citi-data quote are generally based on 2009 estimates, according to the sites I used, which explains why a five-year average seems to work best. 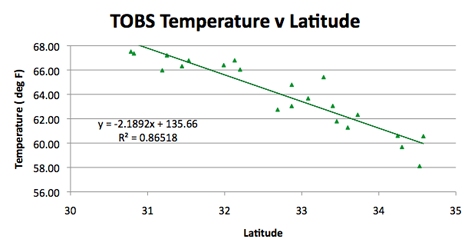 There are a number of stations without full TOBS data in that period, however. I am not sure why the temperature data didn’t follow the expected trend, perhaps when I have this initial series finished, I’ll come back and look into that in more detail.